I use this amazing herb in some form almost every day. A few drops of rosemary essential oil on my hairbrush, rosemary vinegar on my salad, rosemary infused oil to massage my sore shoulders after digging in the garden - the fresh, uplifting scent of rosemary is a constant friend. Early in the day, before the hot afternoon sun releases the resin volatile oil from the leaves, you may want to pinch some fresh sprigs and make some rosemary vinegar for your salad. Chop some up and add to biscuits, quick breads, or roast chicken. Make sure to pick enough to make a strong rosemary tea for a hair rinse, or to start another batch of rosemary infused oil. 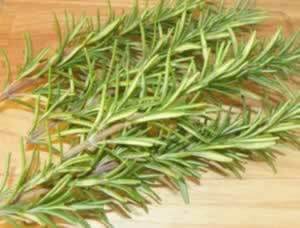 Use rosemary oil in cooking, or as a massage oil to soothe aches and pains.